Labor and employment is complicated.Bugbee lawyers can simplify your life. You may have a business in a risky industry.But you don’t have to take risks when it comes to workers’ comp claims. Bugbee lawyers keep healthcare providers healthy. Protecting you against workers’ comp claims is what we do. 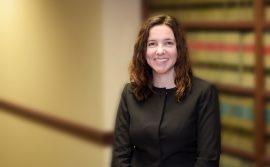 Bugbee & Conkle, LLP is a law firm concentrating its practice in the areas of employment, labor, and workers’ compensation for companies and businesses of all sizes throughout Ohio. In every matter Bugbee & Conkle undertakes, our primary goal is to provide quality, cost-effective and timely legal advice and representation. Bugbee & Conkle’s goal is to exceed client expectations in the delivery of high-quality, responsive legal services. As a firm, Bugbee & Conkle maintains an environment, which our lawyers and staff find professionally satisfying and personally rewarding. Bugbee & Conkle especially values the praise it earns from clients and our integrity in working with others. Going forward, we expect to grow, but will never do so at the expense of either the quality of our services or the quality of our lives. Mr. Barnes’ practice encompasses workers’ compensation defense, administrative and court litigation, labor and employment law, and general civil matters.